Nokia has begun rolling out a new firmware update for the Lumia 800. Firmware 1600.2487.8107.12070 is rumoured to fix among many things, the fast battery drain problem and sound quality. Contrary to speculations on the interweb, I can confirm that it lacks any new camera shooting modes. Despite never truly suffering from awful battery on both my review unit and Batman Lumia (Nokia Diagnostic always reported around 1480 mAh available capacity), the power management on the Lumia 800 could have been better. Now that I have more apps with my Lumia, many which relies on background tasks, the Lumia 800 regularly last half a day of active use before needing a recharge. This isn't ideal as it means I have to carry a portable battery pack with me at all times. I am happy to report that this update does improve the standby time by a significant margin. Nokia's promise to fix the rather awful camera performance has since been met with silence. The latest firmware update 12070 apparently promises to fix the white balance issue, but I can't confirm that yet until I do more shooting. Do note that you will not be getting Internet Sharing with this update. 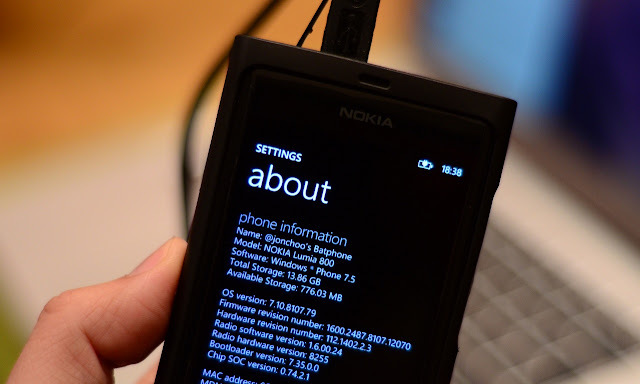 While Internet Sharing is part of Windows Phone 7.5 Mango, operators and manufacturers are free to disable it. While this does not affect me personally, Nokia has promised back in November that the feature will eventually arrive. At this rate I suggest not to bother waiting for one if WiFi hotspot is a deal breaker. As far a sound quality goes, the Lumia 800 is still pretty mediocre. It is one of the reasons why I never reviewed the phone from an audiophile point of view, because it just isn't. The new firmware has tweaked the EQ, introducing more bass in your music. This isn't necessarily a welcomed 'improvement', but from Nokia's partnership with the devil that is Monster, I guess they truly believed that bass = good. Short of releasing a new hardware revision with a lovely audio DAC, the average sound quality isn't something Nokia can easily fix with a firmware update. If you value sound quality, you will want to check out the amazing Sony Walkman X-series instead. Now, the rollout has begun earlier this week in Singapore and India, and will take weeks, perhaps even months, before it reaches every deployed handset. This phased rollout of an important and, some might insist, a deal breaker update is part of Nokia's culture of complacent and is something we are all going to live with. For example I only received firmware 11500 update two days ago, a full 1 1/2 months after Nokia announced its rollout. If you want to get the latest update now, you can force the update through this excellent guide set out by Heathcliff74 on XDA-Dev. This work around also works with other Windows Phone 7 handsets, so if you are finding Samsung and HTC being slow, it is worth visiting the link. The work around is unofficial and may break your phone's warranty, but it beats waiting months for them to press that big red button.